Summary: Florence Nightingale was reared with every advantage: wealth, devoted parents, a fine library and a classical education, travel, and association with the great artists, writers and politicians of the day. What really interested Florence, though, was playing hospital and caring for sick dolls. As Florence grew, she felt God wanted her to help people and sensed that nursing was her calling. The idea horrified her family because nursing in 1850 was not a respectable profession for a girl of her social standing. Still Florence continued to educate herself about the world of medicine by visiting hospitals and orphanages on the European continent, talking with doctors, and keeping copious notes, until her parents reluctantly accepted her decision. Her first work was with a charity hospital in London where she stressed cleanliness, organization, nutritious meals and bells so that patients could summon nurses. In 1854 England was at war with Russia and Florence was asked to take 38 nurses to work in the military hospitals of the Crimean War. The doctors at first refused her help until increased fighting, casualties and death forced them to turn to Florence where her practice reduced the numbers of deaths by two-thirds. It was here that she earned the name “The Lady with the Lamp” as she walked through the hospital at night with a lantern checking on patients. This time of service affected her health and she was an invalid for much of the remainder of her life. Returning to England Florence found that she was famous. People gave money for her cause and she established the Nightingale Training School for Nurses in London, sending her nurses to transform hospital care around the world. Because of her health she could no longer be a nurse; she could still continue to write and influence medical care for the army and for the poor. The Red Cross is an outgrowth of her work. Literary elements at work in the story: This book demonstrates the problems and the blessings of biographies for the young. It is large, colorful and inviting with simple clear text but the “ birth to death” overview omits events and ideas that would bring her story to clearer light. The author had to choose. The pictures are done in water colors that recreate Victorian rooms vividly; the hospital pictures are almost too spacious and sanitary, the children too precious and clean. Pictures and the reality they represent are at odds. As an adult, Florence is easily identified because she always wears a dark blue dress. A useful time line and suggestions for further reading are included at the end. How does the perspective on gender/race/culture/economics/ability make a difference to the story? It took patience, courage, and determination for Florence to realize her dream when the only suitable future for a woman was marriage and children. Doctors at the front were prejudiced against women. Both the advantages of wealth and the needs of the poor are evident. Theological Conversation Partners: “Florence was a religious person, and she felt that God wanted her to help people”. With one sentence Demi deals with the prime motivation of Nightingale’s life. (Nightingale was, in fact, a devout, though unorthodox, Christian who experienced a strong call from God and who was influenced by a Lutheran orphanage and Catholic sisters. She was a universalist and appreciative of other faiths but she was a member, a critical member, of the Church of England all her life.) Should children be curious about her religious motivation the answers will need to be found outside these pages. Her life opens the themes of “call” or “vocation”, of the gifts we receive and our stewardship of them. She is a model of disciplined preparation, of perseverance in practice, of broad compassion. Her influence, as salt and light, has permeated medical care around the world. The Bible is full of instances of specific calls, some to heal: Isaiah 6: 8; Matt 1:18-22; Luke 9:1,2.;Romans 1:1; 1 Cor. 1:1. Paul reminds us that the Spirit has given gifts to each member of the Body of Christ, 1 Cor: 12:4-7. 1 Peter 4:10 is an admonition to use our gifts to serve. Jesus’ parable of compassion, Luke 10:25-37, is well illustrated by Florence’s life. Have you ever been in a hospital? 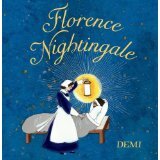 It can be very good place to get well, thanks to Florence Nightingale. Look at some of the pictures in the book and see what hospitals were like before she changed them. Florence Nightingale was a very gifted person. What were some of these gifts? What were some of her abilities and experiences. How can an experience be a gift? Paul tells us the Spirit gives every Christian gifts to be used for others. Do you know people with gifts or abilities? What gifts has God given you to help others? Florence felt that she was called by God. Another word for call is “vocation.” Some people feel this call at an early age and it becomes the work of their lives. How did Florence hear this call? What did this call mean for Florence’s life? How did she prepare for it? Can you think of other people in the Bible who were called? What does God call you to do today ? Regular contributor Virginia Thomas offers the third review in a six book series of biographies for children and young people. Florence Nightingale by Storypath is licensed under a Creative Commons Attribution-NonCommercial 4.0 International License.